Multidrug-resistant Acinetobacter baumannii, initially considered as having a poor clinical relevance, is frequently isolated from infection cases in intensive care units. We describe the epidemiology of carbapenem resistant A. baumannii (CRAB) in a general ICU in Palermo, Italy, from October 2010 to March 2011. 58 of 61 isolates exhibited MICs for meropenem or imipenem ≥16 mg/L. Forty-nine carried blaOXA-23 and two blaOXA-58 genes. Five subtype clusters were detected by rep-PCR. Clusters D and E included 10 isolates that tested negative for the carbapenem resistance genes. MLST attributed all isolates, but two, with sequence type (ST)2, whereas the two remaining isolates with ST78. The respiratory tract was the most common site of infection (26 out of 36 cases. 72.2%). A high infection related mortality rate was observed (18 out of 35 patients, 51.4%). Nineteen patients tested positive for other multidrug resistant organisms in addition to CRAB. In eight cases isolates belonging to distinct subtype clusters and/or with distinct carbapenemase profiles were identified. Carbapenem resistance was prominently driven by the dissemination of CRAB isolates belonging to ST2, carrying the carbapenemase gene blaOXA-23. The colonization/infection of some patients by multiple strains is suggestive of an endemic circulation of CRAB. Eighty-four consecutive CRAB isolates were recovered from 36 patients, who were admitted to the ICU under study between October 1, 2010 and March 31, 2011. Based upon the inclusion criteria, 61 isolates were submitted to testing by PCR analysis to confirm the presence of carbapenemase genetic determinants and molecular typing by rep-PCR and, for representative isolates, by MLST. A number of isolates from each patient ranging between one and six was analyzed. The clinical samples more prevalent were bronchial aspirates (n. 29), followed by swabs from wound or tracheostomy (n. 8), blood (n. 7), drainage fluids and tips of central venous catheter (n. 6 each). Among the 61 isolates, all (100%) were resistant to penicillins (ampicillin, carbenicillin), cephalosporins (cefepime, cefotaxime, ceftazidime), β-lactam-β-lactamase inhibitor combinations and fluoroquinolones, whereas susceptibility to aminoglycosides [amikacin, four (6.5%) susceptible and two (3.3%) intermediate; gentamicin, one (1.6%) susceptible and nine (14.7%) intermediate; tobramicin, six (9.8%) susceptible and 12 (19.7%) intermediate) and sulfamethoxazole-trimethoprim, nine (14.7%) susceptible] was variable. Moreover, 50 (82.0%) and 11 isolates (18.0%) tested, respectively, susceptible (MICs 0.5 – 2 mg/L) and intermediate (MIC 4 mg/L) to tigecycline. Only colistin showed 100% susceptibility with MICs ranging between 0.5 and 2 mg/L. Three strains only had a MIC for imipenem of 8 mg/L, whilst all the remaining isolates exhibited MICs ≥ 16 mg/L. Moreover, MICs for meropenem were ≥ 16 mg/L for all, but three strains that showed MICs of 4 and 8 mg/L in one and two cases, respectively. The 61 CRAB strains were investigated for the presence of carbapenemase genes. All isolates harboured a blaOXA-51-like sequence. Forty-nine isolates had, in addition, blaOXA-23 and two only blaOXA-58 genes. No MBL (IMP and VIM) gene sequence was detected. The two OXA-58 isolates had MICs for imipenem ≥ 16 mg/L, whereas for meropenem of 4 and 8 mg/L, respectively. Ten isolates for which the imipenem MIC was ≥ 8 mg/L had an unidentified carbapenem resistance mechanism. All tested negative for the blaOXA-143 sequence. Presence of ISAba 1 in the promoter region of the blaOXA-51-like gene was not investigated because of the inconsistent literature findings about its correlation with carbapenem resistance and the possible involvement of alternative mechanisms [1, 2]. By adopting a similarity coefficient of ≥95% as the threshold, all isolates, but one, clustered into five distinct groups named A to E (Fig.1). Thirty-one out of 61 clustered in a large group that included 29 blaOXA-23 and the two blaOXA58 isolates. Two further subtype clusters, B and C, included 6 and 13 OXA-23 producing isolates, respectively. Strains belonging to the subtype clusters A, B and C clustered at a 94% similarity level. Cluster D and cluster E grouped eight and two isolates, respectively, that tested negative for the carbapenem resistance genes under investigation. One isolate only did not cluster. MLST attributed all isolates, but two, with sequence type (ST)2, whereas the two remaining isolates belonged to ST78. There was not apparent relationship between subtype clusters, carbapenem resistance genes and the whole resistance patterns or carbapenem resistance phenotype. Twelve out of 14 isolates showing susceptibility or intermediate susceptibility to at least one aminoglycoside were isolated in the first three months of the investigation. The main demographic and clinic characteristics of the 36 patients are summarized in Table 1. The respiratory tract was the most common site of infection (26 out of 36 cases, 72.2%). Moreover, a high infection related mortality rate was observed (18 out of 35 patients with a known outcome, 51.4%). From 19 patients other MDR organisms in addition to CRAB were isolated from at least one clinical sample (Table 1). Of special interest, eight patients were co-colonized or co-infected at the same site of CRAB by Klebsiella pneumoniae carbapenemase-producing Klebsiella pneumoniae (KPC-Kp). AMI = acute myocardial infarction; BSI = bloodstream infection; CKD = chronic kidney disease; COPD = chronic obstructive pulmonary disease; LRTI = lower respiratory tract infection; RTI = reproductive tract infection; SLE = Systemic Lupus Erythematosus; SSTI = skin and soft tissue infection; KPC-Kp = KPC carbapenemase-producing Klebsiella pneumoniae; ESBL-Kp = Extended spectrum β-lactamases producing Klebsiella pneumoniae; ESBL-Ec = Extended spectrum β-lactamases producing Escherichia coli; MRSA = methicillin resistant Staphylococcus aureus; MRSE = methicillin resistant Staphylococcus epidermidis; SAPSII = Mean Simplified Acute Physiology Score II; u.i = unavailable information. From 19 out of 36 patients two to six CRAB isolates were consecutively identified in the period under study. In 11 patients an indistinguishable CRAB isolate was repeatedly identified, unlike from the remaining eight patients. In particular, three out of these patients yielded isolates belonging to distinct subtype clusters and/or with distinct carbapenemase profiles in different clinical samples obtained up to 24 hours apart from each other; alternatively, distinct isolates were sequentially identified from the same or different clinical samples from five further patients within intervals of time ranging between four and seventy days (Table 2). * patient’s numeric code refers to Table 1. BA, bronchial aspirate; CVC, central venous catheter; CSF, cerebrospinal fluid. The emergence of multidrug-resistant Acinetobacter baumannii strains is posing severe challenges in many clinical and post-acute care settings [3, 4]. Initially considered as a colonizing bacterial species with poor clinical relevance, it is being isolated more and more frequently, especially in the intensive care units (ICUs), as the etiological agent of serious infections, such as ventilator-associated pneumonia (VAP), infections of bloodstream, urinary tract, central nervous system and wounds . A. baumannii is typically selected by prior antimicrobial treatments, but in turn infections caused by this organism are difficult to treat, so leading to increasingly rely on last resort molecules, such as polymyxins and tigecycline for therapy . Additionally, infections with carbapenem-resistant A. baumannii (CRAB) organisms may require discharged patients from acute hospitals to be further managed in long-term care facilities (LTCFs) or alternative post-acute care facilities and impose diagnostic, therapeutic and infection-control extra-costs [7, 8]. Isolates of A. baumannii carry a naturally occurring blaOXA-51 β-lactamase with a weak carbapenemase activity. Moreover, in a great proportion of isolates from different geographical areas, carbapenem resistance in A. baumannii is mediated by the acquisition of a class B or a class D carbapenem-hydrolyzing enzymes . In Italy, blaOXA-58 has been reported to be the most prevalent OXA type carbapenem resistance gene, but a shift towards blaOXA-23 that appears to be gradually substituting blaOXA-58 has been recently described [10–12]. This trend is likely to be related to the a higher carbapenemase activity of blaOXA-23 than blaOXA-58 that results in higher carbapenem MICs and a consequent selective advantage. However, large scale data on the prevalence of these genes throughout Italy are still scarce. 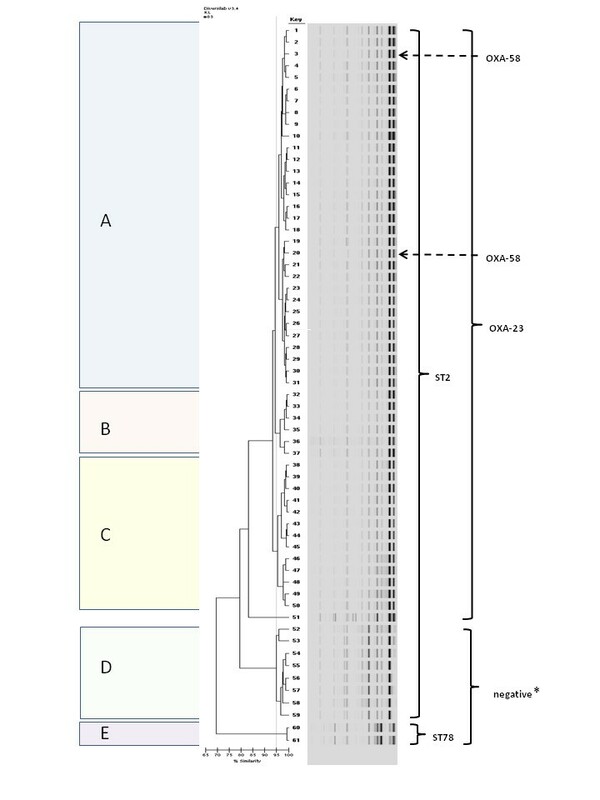 Genotypic characterization of A. baumannii has shown that distinct clonal lineages, the so-called European (EU) clones I, II and III, are widely spread across Europe and include strains that are usually multiresistant (MDR) and responsible for epidemic and endemic occurrence of healthcare associated colonization and infection . The objective of our study was to analyze the spread and clonality of CRAB in a general ICU in Palermo, Italy, by prospectively collecting and characterizing isolates from infected patients who were being admitted to the ICU over a six-month period from October 2010 to March 2011. Medical records of patients from whom CRAB was isolated were also retrospectively reviewed to investigate their clinical outcomes. The 2nd ICU of the ARNAS “Civico & Benfratelli” General Hospital of Palermo, Italy, is a 10-bed medical-surgical Unit with approximately 430 admissions per year. Preexisting medical and surgical conditions are generally present in approximately 45% and 55%, respectively, of all admissions. Organ failure is the leading cause of admission (70%), followed by monitoring/weaning from mechanical ventilation (30%). ICU mortality is about 25%. Nurse to patient ratio is 1:2. Consecutive CRAB isolates were recovered from all patients who were admitted to 2nd Intensive ICU during the six-month period October 1, 2010 – March 31, 2011. For the purpose of this study, the following inclusion criteria were used for the selection of CRAB isolates to be submitted to molecular typing: a) all the unique isolates from different patients; b) replicate isolates obtained from different clinical samples of the same patient up to 24 hours apart from each other; c) replicate isolates obtained from the same patient more than 24 hours apart from each other from whatever clinical sample. CRAB isolates were isolated by standard methods and identified by the Vitek 2 automated microbiology system (bioMérieux, Marcy l'Étoile, France). Antimicrobial susceptibility testing was automatically undertaken by using the commercial microdilution method Vitek 2. The MICs of imipenem and meropenem were determined by using the epsilometer test (Etest, AB Biodisk, Solna, Sweden). Results were interpreted according to Clinical and Laboratory Standards Institute (CLSI) criteria for Acinetobacter spp . Due to the lack of standardization for A. baumannii Enterobacteriaceae breakpoints (≤2 μg/ml, susceptible; ≥8 μg/ml, resistant) were used for interpreting the results of the tigecycline assays. The control strain used was Escherichia coli ATCC 25922. To detect the presence of the most common carbapenemases, multiplex PCR was performed with primers that anneal to blaOXA-51blaOXA-23blaOXA-24 and blaOXA-58 carbapenemases and the MBLs blaIMP and blaVIM, as previously described [14, 15]. The newly described gene blaOXA-143 was also searched for . To investigate the relationship among the CRAB isolates collected during the study period, we used the rep-PCR DiversiLab Microbial Typing System® (bioMérieux, Marcy l'Étoile, France), which amplifies the regions between the non-coding repetitive sequences in bacterial genomes. Extraction of DNA was performed using the UltraCleanTM Microbial DNA Isolation Kit (Mo Bio Laboratories, Inc., Carlsbad, CA, USA). Rep-PCR was performed using the DiversiLab Acinetobacter kit. DNA fragment separation and detection were done using the Agilent 2100 Bioanalyzer (Agilent Technologies, Santa Clara, CA, USA) and results were analyzed and interpreted using the Kullback–Leibler method, as previously reported . Isolates were defined as genetically related when ≥95% similarity was identified. Genotyping by multilocus sequence typing (MLST) was performed on representative CRAB strains selected on the basis of clustering by rep-PCR and carbapenemase gene pattern. MLST was based on the sequence analysis of the internal portions of seven housekeeping genes (cpn 60, fus A, glt A, pyr G, rec A, rpl B and rpo B). All PCR amplifications were carried out under the following conditions: 30 cycles (denaturation at 94 °C for 1 min, annealing at 53 °C for 1 min, and extension at 72 °C for 1 min) preceded by a 5-min denaturation at 94 °C and followed by a 10-min extension at 72 °C. PCR products were sequenced in both directions by using BigDye fluorescent terminators and primers on a 310 DNA analyzer (Applied Biosystems, Warrington, United Kingdom). Details of the MLST scheme including amplification and sequencing primers, allele sequences and STs are available at Institute Pasteur's MLST Web site (http://www.pasteur.fr/mlst). The medical records of patients from whom CRAB was isolated were retrospectively reviewed. The following demographic and clinical data were obtained: age, gender, reason for admission, underlying diseases, type of infection and clinical manifestation, Mean Simplified Acute Physiology Score II (SAPS II), isolation of other MDR organisms, such as ESBL producing enterobacteria, vancomycin-resistant Enterococcus spp. (VRE) and methicillin-resistant Staphylococcus aureus (MRSA), if any, and outcome (dead/discharged). This research conformed to local legislation and the Helsinki Declaration and was approved by the ethics committee of the ARNAS General Hospital “Civico & Benfratelli, Palermo, Italy. CRAB is an healthcare serious issue in many European countries. Literature shows that carbapenem resistance rates are higher in southern Europe countries, such as Turkey, Greece, Spain and Italy . In Europe, outbreaks are especially attributable to two main A. baumannii clones (the so-called European clones I and II) . Clone II has been repeatedly reported in many European countries, including Italy [5, 8–10]. With regard to the mechanism of carbapenem resistance in the Italian CRAB isolates, the spread of carbapenemases belonging to the molecular class D OXA enzymes has been well documented [8–10, 19–22]. Our study reveals that carbapenem resistance in the ICU under study was prominently driven by the dissemination of CRAB isolates belonging to ST2, the European clone II, carrying the carbapenemase gene blaOXA-23. Of interest, in comparison with the data obtained by previous studies conducted in Italy, as well also in other Mediterranean countries, the prevalence of blaOXA-58 carrying isolates appears to be drastically lower [10, 21, 22]. Emergence of an epidemic lineage carrying blaOXA-23 carbapenemase genes that is displacing a genetically closely related CRAB clone encoding OXA-58 has been previously described in central Italy in a study involving 10 ICU . The higher level resistance to carbapenems conferred by OXA-23 is thought to be the success key of OXA-23 carrying epidemic strains under the selective pressure due to the increasing use of carbapenems, mainly in combination with fluoroquinolones, forced in turn by the epidemic spread of extended spectrum β-lactamase producing organisms . Five subtype clusters were recognized by rep-PCR typing, with the first three – A to C – appearing to be closely related and all belonging to ST2, so suggesting the dissemination in the ICU of at least three well differentiated clones. Isolates belonging to two of them, D and E, tested negative for carbapenemase genes under study, except for blaOXA-51-like. The two isolates belonging to the subtype cluster E were attributed with ST78, the so called “Italian clone”. This clone, after being identified firstly in Naples, Italy, in 2006–2007 as an emerging epidemic clone, has been subsequently identified in other cities of southern Italy, Catania, and northern, Italy, Novara, accounting for a 13% proportion of isolates [10, 20–22]. More recently, the same clone has been detected in ICUs, but also in home-care patients in Palermo, Italy . Hence, ST78 seems to have largely disseminated in Italy [20–22]. The detection in a same patient of CRAB isolates belonging to different subtype clusters is a concerning finding. An underestimation of the event is very likely due to the routinely adopted microbiological diagnostic procedures, that are not aimed at detecting a mixed population of CRAB in patient or a clinical sample. Furthermore, because an active culture surveillance program was not in place in the ICU under study, prevalence of CRAB positive patients/sites is likely to be much higher and the relative proportion of the different strains misrepresented. Nevertheless, identification of distinct strains in an interval of time of 24 hours strongly suggests that some patients could be simultaneously or sequentially colonized or infected by multiple strains. The clinical and prognostic significance of such a finding deserves further investigation. The variety of subtype clusters could be likely interpreted as suggestive of a situation of endemicity where the selective advantage conferred by the high level carbapenem resistance supports the epidemic spread of the ST2 lineage carrying the blaOXA-23 determinant. According with previous Authors, our data confirm that CRAB is one of the most challenging Gram-negative pathogens to control and treat in the ICUs, resulting in serious infections and substantial mortality [24, 25]. Unfortunately, infection control measures used to contain the CRAB dissemination can be very difficult to be applied and substantially ineffective when it has become endemic. On the other hand, compelling evidence has accumulated about the contribution that contaminated surfaces make to the epidemic and endemic transmission of many MDR organisms and above all CRAB and MRSA [26, 27]. Spread in the healthcare settings of CRAB is posing extremely challenging questions about the most effective strategies to be adopted in the infected patient management as well as in the control and prevention of transmission within and between the healthcare facilities. A timely recognition and an accurate description of the CRAB strains and clones that are spreading in a defined area can contribute to obtain a more reliable epidemiological picture and to devise effective and targeted control measures. We would like to thank all the personnel of the Laboratory of microbiology and the II Intensive Care Unit of the ARNAS General Hospital “Civico & Benfratelli, Palermo, Italy, for their helpful contribution in collecting microbiological, epidemiological and clinical data. CM and DMP designed the study. CS, MAS and MSV were in charge of identify and collect strains and information about them. CB, AA,TF and CC carried out typing of isolates and characterization of resistance genetic determinants. DMP, ANC and RT provided the clinical data about patients. CM, DMP, CB and ANC analyzed the data and wrote the paper. RT supervised the study. All authors read and approved the final manuscript.